Marc by Marc Jacobs MBM2553 chronograph women’s watch features a 40mm wide and gold tone solid stainless steel case with textured crown and function pushers. Marc by Marc Jacobs MBM2553 is powered by a reliable quartz movement. This stylish watch also features chronograph functions, a sharp looking black dial with luminous hands and rose gold tone Arabic numeral hour markers, protected by scratch resistant mineral crystal and water resistant depth is 50 meters. 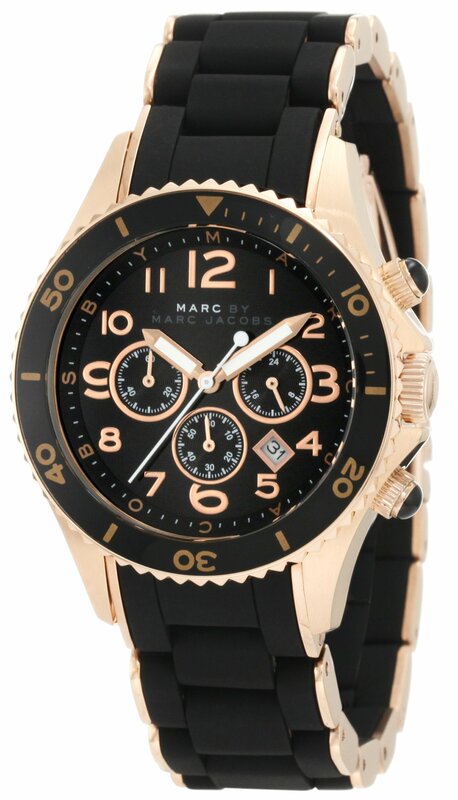 Marc by Marc Jacobs MBM2553 is equipped with a 32mm wide black rubber bracelet with rose gold tone stainless steel inserts and secured with deployment clasp.